We weren’t even going to stop in Hoi An originally. Then we decided we would spend a quick two days, and then as we ran into the New Year (when everything closes down) it became four nights…but we could have stayed 4 more. There are over 400 tailors in the tiny little town of Hoi An. It must be the best value in the entire world for having clothes custom-made. We spent a lot of time wondering in and out of shops between visiting the sites around town before settling on the right tailor for us. Some tailors didn’t do the dress style I wanted, others seemed to have lesser quality fabrics, and then some refused to negotiate a fair price due to not wanting to work over the New Year. I commissioned a few dresses (around $25US each!) and they managed to talk Tim into getting a grey pin-striped suit made (price tag $85US). The greatest thing is not only the amazing value, but I underestimated how fun it was getting custom dresses made. I was ecstatic to have a dress that fit me everywhere! I went back to her two more times to get dresses made for other people because I was having so much fun mixing and matching fabrics and styles. Tim was starting to worry that he may have to stage an intervention. 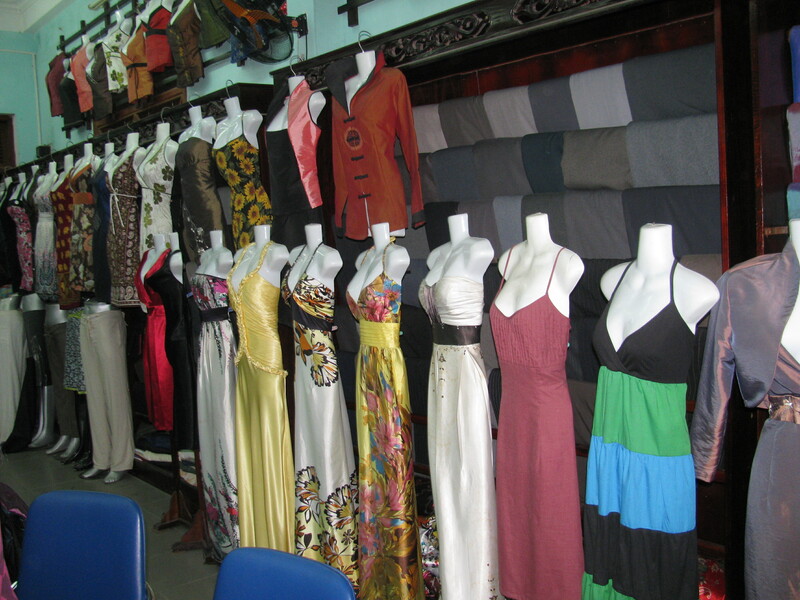 Once we had decided to order clothes we knew we were shipping a box home, and at that point I looked at what else Hoi An has on offer – and the custom clothes isn’t the only good deal. They have everything from polo shirts, jewelry, and gallery paintings for the best prices we had seen anywhere in Southeast Asia. Even Tim enjoyed shopping around for deals, because everything was so reasonable! We enjoyed Hoi An because of more than just the shopping though. 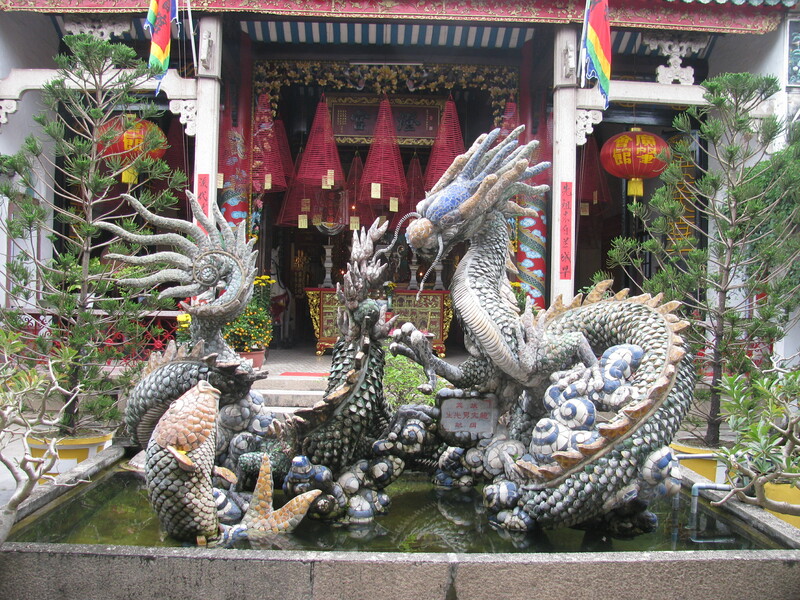 Hoi An has amazing temples, both modern and ancient, and we were there for Tet (New Years). There was a show, fireworks and all out party on the River! Celebrating Tet was a blast because it’s the holiday equivalent of finding a $20 bill you didn’t know you had. We just showed up, and let the Vietnamese show us how Tet’s done – and we had no complaints. 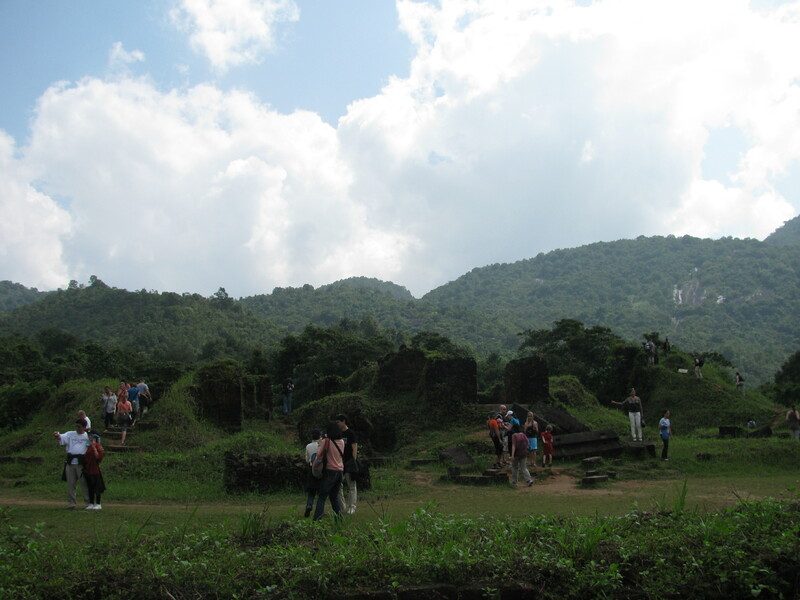 I would like to think Tim and I will visit Hoi An again someday, and when we do, I will be bringing an empty suitcase. It looks like a fun place. Maybe Dad & I can go with you when you go back. Looking forward to seeing you both soon 🙂 We love you!!!! Hoi An is just an awesome little, as well as little known, town. One of my favorites on earth!!! Stunning ! Amazing ! What a find. And the stories just go on and on … like true love. Coming home any time soon ? 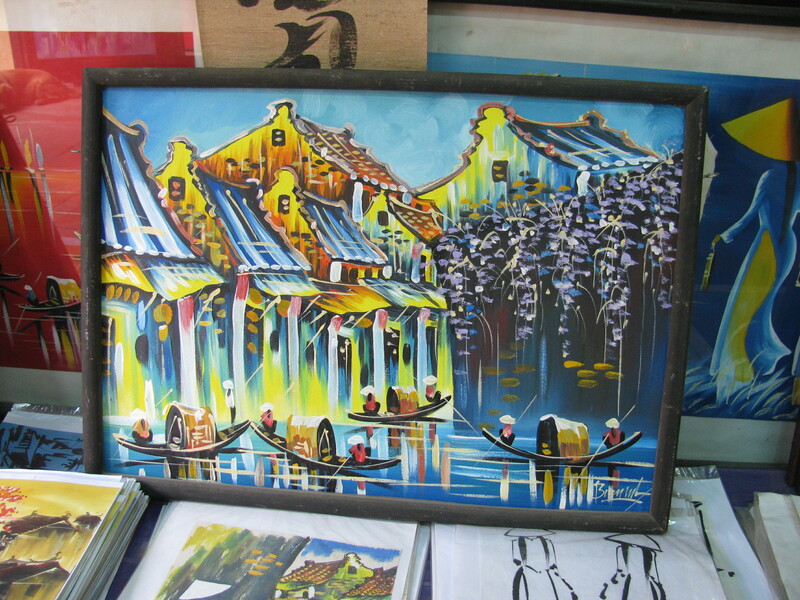 Hope you had the opportunity to play “bài chòi” during your visit to Hội An.. The Vietnamese version of bingo, you may have seen it played down by the river bridge. The of course there is always the old standby game of “break the pot” which I think the Vietnamese copied from the Mexican Pinata game! We definitely saw them breaking pots. We saw them playing a game that is played on a checker/chess board a lot I’m not sure if that is “Bai Choi”…whenever they played there were always 20 or so people standing over one or two people who were sitting and playing. Hello ! I would like to know how long it took for them to finish your dress? Emilie – I think you can usually have it done within 48 hours (maybe less if you’re willing to pay or business is slow), it will depend on the shop, but you should tell them your time frame as part of the negotiation process. Views expressed on this blog are solely the opinions of the blogger. Media found on this blog is for preview use only. If any artist or their representation wish to have the links removed, contact me and I will happily comply!